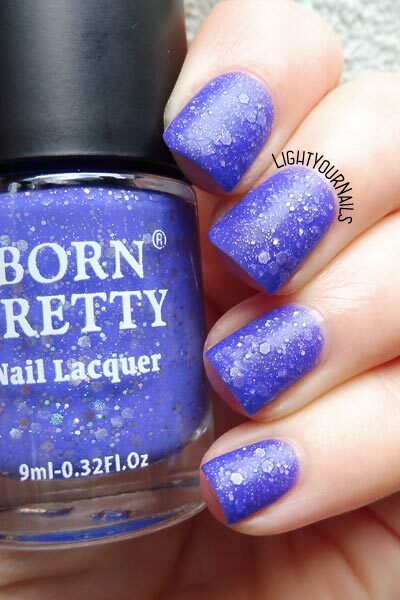 Bornpretty Thermal Nail Polish G001 Swan Lake | Light Your Nails! Today I am showing you a nail polish that literally won my heart and that I’m still wearing on my nails right now. It’s a thermal nail polish, i.e. it changes colour depending on the temperature. Bornpretty G001 Swan Lake* is part of an 8-pieces collection by online Chinese shop Bornprettystore. This collection is all about thermal nail polishes in different shades and finishes. 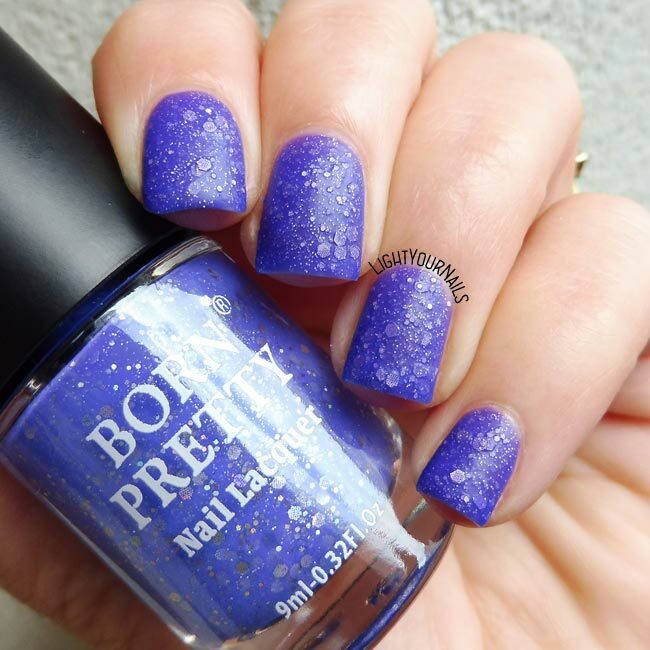 Swan Lake is a glittery nail polish that goes from light blue to indigo trough different shades of blue and purple. It’s very cold here so it’s dark blue/purple 99% of the time on my nails. At first I was very worried about it. It’s incredibly thick and I thought it was impossible to paint . I was so wrong! The brush is curved and it really helps application. First coat is basically clear with glitter, second coat adds colour and it’s perfect at third coat. I must add doing 3 coats is not a pain at all, it’s easy and quick to apply. Despite the thick formula this nail polish dries incredibly quick and there’s no need to wait between coats. It also dries matte so you save the top coat anyway. Lasting time is also incredible. I painted my nails Saturday morning, it’s now Monday evening and it’s just perfect. It looks like I’ve just done mani. No tip wear, no chipping. Wow. And again: no top coat. The glitters in it are holographic by the way, unfortunately I just couldn’t capture them in photos. The nails are not smooth at touch, but they are not as gritty as an ordinary glitter or textured nail polish. It’s quite weird and it doesn’t bother at all, nor does it catch into clothes. Shall we talk removal given it’s so packed with glitters? There’s good news! This is a peel-off nail polish. This means you just need an orange stick to lift it away in one single piece. How do I know? I just removed it from my thumb while writing. But let’s see the photos: three coats, no top coat. I can’t explain how surprised I am by this nail polish. I mean, I’ve always been happy with Bornprettystore products but I had no extreme expectations about this one. But I was so wrong, I just can’t find a single flaw in this nail polish, every detail is just perfect. No need to say I absolutely want all other available colours. If you are into thermal nail polish I suggest you keep an eye out for Black Friday sales. It’s only 4,99$ now but if you can get it for even less.. why not? This is the link to check it out and please tell me how you like it! Ne ho presi un paio anche io, sto aspettando che arrivino, conoscendomi li luciderò comunque con il top coat! Ci ho provato a mettere il top coat ma non mi è piaciuto per niente e sono tornata matte subito! Ti assicuro che alla fine sono molti più di due i colori! Azzurro ghiaccio, azzurro medio, viola! It is a beautiful nail polish and it's fantastic that it is a peel-off one! It's so handy for removal! How fascinating! A glitter, thermal, peel-off polish. Born Pretty Store is so innovative. I love how they really upped their game lately! Thank you! I couldn't really picture the transition in a single photo but I still wanted to show how different it can be! Che bello che è!! Vedere le varie sfumature che può avere questa tipologia si smalto è affascinante! Non sapevo ci fossero gli smalti termici! Sììì! Anche Layla ne ha una collezione!